Switzerland is not a cheap country to visit, but here's 5 tips and lessons I learnt from various sources that really helped me keep the cost of my euro trip down whilst still experiencing much of what the Berner Oberland region has to offer. An important lesson I learnt during my time in Gimmelwald and the Berner Oberland region was to not over plan my itinerary. Although having a well planned itinerary may work well in busy/fast paced cities like Paris, the Berner Oberland region is a lot more relaxed/slow paced and as such you will enjoy yourself a lot better by going with the flow. One example where over planning affected my trip was on the day of my departure from Switzerland where I had pre-booked my outbound intercity train from Interlaken to Rome with just a two hour buffer for me to get from Gimmelwald to the Interlaken train station. 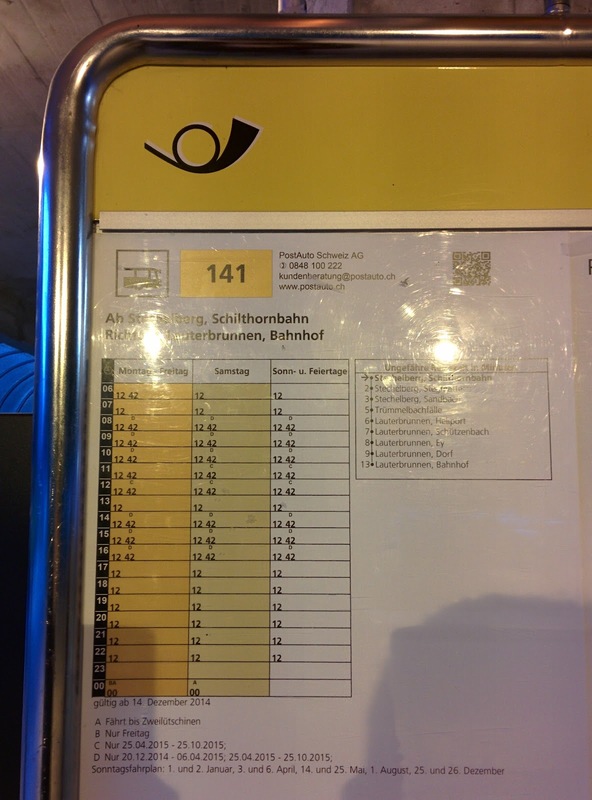 My failure to provide enough of a buffer meant that I nearly missed my outbound train when two scheduled bus services to Lauterbrunnen ran by Post Bus went missing in action (both the 6:12am and 7:12am services didn't arrive). Luckily the staff from the gondola company came to the rescue and drove a group of waiting passengers to the Lauterbrunnen station so that we could take the local train to Interlaken. Aside from allocating sufficient time for public transportation delays, being spontaneous and flexible in your daily activities is going to help you enjoy your time in the region. 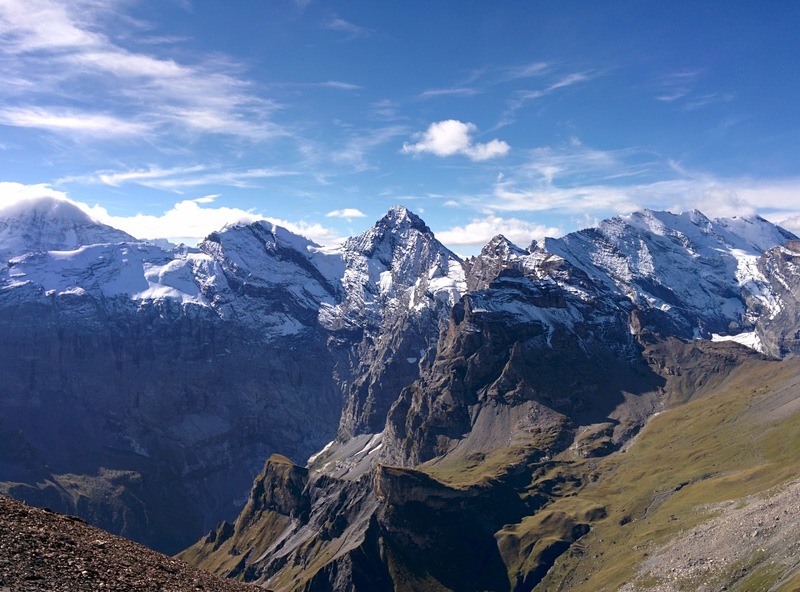 For example, visiting the Schilthorn peak is dependent on good weather for you to have good visibility at the summit. Bad weather on the day you were planning to visit Schilthorn? postpone your visit to the summit and enjoy a hike in the region instead (safety permitting). The Swiss Half Fare card provides you with half-price travel on local/regional public transportation including buses, trains, boats and more importantly mountain railways/gondolas. At 120 CHF from the SBB website or Rail Europe, this one month pass is not cheap, and you will need to do some calculations at your end to see if you will benefit from it. From my own calculations, you will likely need to be travelling in public transportation for about four days or more before you start seeing benefits of this pass. One of the more interesting lessons I learnt in the Berner Oberland region is the importance of having a good trail map can provide when unfamiliar with the location/environment. I set out on my hike with a free map (similar to this) I received from my bed and breakfast host and was luckily enough in the company of an experienced hiker who was also a guest at Esther's Guesthouse. Unfortunately, the map we had wasn't very detailed and we struggled with using it for navigation. I probably should have headed to the information/tourist center to get more information before going for my hike. Though the trails were for the most part well marked, there were occasions where there were trail intersections that were not so well marked. As both of us were new to the region, we drifted off our initial intended path of the North Face Trail and ended up on a trail graded for more experienced hikers (we must have missed a turn off somewhere). The unexpected detour did have it's upside as we were met with stunning views as we ascended the alp. In my experience I've learnt that there is generally enough markings on the trail to "easily" get back to the large towns, but I had challenges with navigation to stay inside a specific trail or route so that I can visit more remote locations. Last but not least if there was something I wished I did, it would be to improve my fitness levels prior to going to this trip. Having a good fitness level, will help you deal better with the terrain and more difficult breathing associated with being above sea level. I would also recommend checking out the region guide book Rick Steve's Best of Europe 2015 or the city guide book Rick Steve's Snapshot Gimmelwald and the Berner Oberland (Affiliate Link) as it also includes some recommended hiking trails (as well as very useful information on the city). Make sure to buy the latest version as some guide books are updated yearly. 4. Make use of the Schilthorn's "deals"
There are probably two "hot ticket" activities in the Berner Oberland region, Schilthorn and Jangfrau both of which are very expensive activities. As I had limited budget for my trip, I could only choose one of them, and in the end decided for the Schilthorn as I read about the incredible views in the summit. Breakfast combo - available with and without the half fare pass. This is a good alternative to the early bird if you wish to have a buffet breakfast in the revolving restaurant. Remember to check out the live cams showing visibility at the summit before you purchase your ticket to ensure you don't go to Schilthorn when all you can see is clouds. Eating and sleeping in Berner Oberland is among the most expensive (even more so than Paris and Rome) as the remoteness of the region means I didn't have access to as many street foods as I did in the more populated areas of Paris and Rome. Stay in a hostel or reasonably priced bed and breakfast - I stayed at Esther's Guesthouse which provided a unique and friendly experience at a reasonably priced 60 CHF per night for the smallest room. Prepare your own meals by buying groceries from the local farmers and the Coop Supermarket (though Coop wasn't available in Gimmelwald, one is available in Murren which is 30 minutes walk each way). Esther and her team also offered reasonably priced breakfast and packed lunch which I utilized a few times so that I can try the fresh produce from the locals e.g. cheese, bread and eggs.